Just felt obliged to share this photograph I took of my dog Dylan. Sitting in the car down the beach, waiting for the rain to stop so I could take him out for his morning walk. After about 30 minutes of waiting, I looked in the rear view mirror and saw Dylan just resting his head on the rear seat, looking out of the rain splashed window. Grabbed my iPhone 4 and swiveled round best I could in the drivers seat and took this shot. Slightly out of focus but other than that, I just love how Dylan seems to be just sadly looking out, longing for the rain to stop. Bless him, looks so forlorn. Passed the photo through a filter in the Camera + iPhone application, and then a little unsharpmask in Photoshop when I got back home. View original Dylan on Flickr. 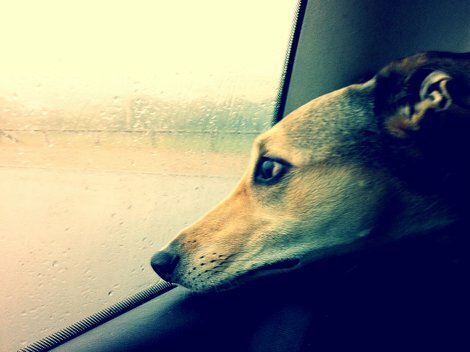 Breadcrumbs: Home » Flickr » Will the rain ever stop?